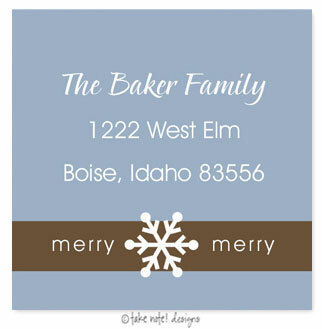 Wonderful self-adhesive labels by Take Note Designs - great for use on your envelopes or gifts! You specify the typestyle and text to be printed. Text layout and formatting will be at the discretion of the typesetter. If you want to see exactly how your label/sticker will print, you may purchase a proof for $3.00. Pointed Brush and Avant Garde shown. You may choose to specify up to 2 typestyles to be used on the stickers. Proofs are available via e-mail for an additional fee (you will receive in 1-2 working days). If you want to see exactly what your product will look like before it is printed, please order a proof. Rush processing is available for an additional fee ($6.00) which would shorten the production time to 1-3 working days. This does not affect ship time. Where should Typestyle #2 be used?